An unusual thing happened in Hollywood on a recent weekend: Director Alex Proyas and Lionsgate apologized for ethnically inaccurate casting in "Gods of Egypt" — a full three months before the movie is set to hit theaters. 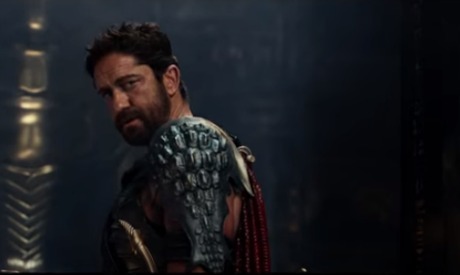 The fantasy epic stars Scottish actor Gerard Butler and Danish actor Nikolaj Coster-Waldau as mythological Egyptian gods, and a recently released trailer renewed concern about Hollywood's long tradition of casting against race. In the jointly issued statements responding to social media criticism, Proyas acknowledged that the choices should have been more diverse and Lionsgate pledged to do better in the future. While some praised the preemptive mea culpa, including "Selma" director Ava DuVernay and the Casting Society of America, others were more skeptical, concluding that it's simply meant to shut down any further backlash. It's also a reminder of how it often takes Hollywood years to make a movie, causing some films to lag behind shifting social attitudes when they're finally released. "The apology is an attempt to have it both ways," said professor Todd Boyd, chair for the Study of Race and Popular Culture at the University of Southern California. "They want the cast that they selected and they don't want people to hold it against them that it's a white cast." Authenticity in casting has become a major discussion point in recent years, thanks in part to the amplifying effect of the Internet. Petitions spring up as soon as questionable castings are announced. Such was the case with Joe Wright's "Pan," when Rooney Mara was announced as the choice to play the Native American princess Tiger Lily in March of 2014. But the topic doesn't end with angry tweets and online petitions. In his Netflix show "Master of None," Indian-American comedian Aziz Ansari recently called out the whitewashing of Indian roles in Hollywood films like "The Social Network" and "Short Circuit." While the practice didn't go unnoticed before, now it's becoming more of a liability. "There was a time when studios thought audiences could handle Mickey Rooney playing I. Y. Yunioshi in 'Breakfast at Tiffany's," said Adam Moore, SAG-AFTRA's National Director of Equal Employment Opportunity and Diversity. .' "That's not happening today. No one is going to think that's OK. Things have changed." But there's also an inherent tension between art and authenticity. "From a performer's perspective, it is not supposed to matter what ethnicity, race, sexual orientation or age you are, it's what you can play. That's what our federal and state laws say," added Moore. "You can't ask someone when you're casting 'Memoirs of a Geisha' if they're Japanese." Casting is a complex art and each production is different in terms of objectives, who makes the calls, and why specific decisions are made. Still, public backlash to castings that are seen as inauthentic are almost inevitable now. When the issue has come up over the past few years, filmmakers and actors have either stayed silent, cited financial realities ("Exodus: Gods and Kings"), artistic vision ("Pan") or apologized after the fact ("Aloha"). "Exodus: Gods and King" was a particular tipping point in the conversation. Director Ridley Scott brushed off condemnations at the time, blaming the model of financing Hollywood movies for his choices. He told trade publication Variety that he would not be able to get the film financed by casting "Mohammad so-and-so from such-and-such." So the filmmakers behind "Gods of Egypt" addressed the whitewashing on their own terms — just as the marketing campaign was kicking off. Lionsgate was in a tricky spot with "Gods of Egypt." The "Exodus" controversy seems ages old to the public, but "Gods of Egypt" had its main cast set over a year before "Exodus" hit theaters last December and wrapped shooting long before Scott's choices were being publicly lambasted. "What I think that people are going to start to see is it's going to become a bad decision, business-wise. It's going to be a gamble to do things like this," said Moore. "Exodus: Gods and Kings" was critically panned and flopped at the domestic box office, earning only $65 million on a $140 million budget. (It earned $268.2 million worldwide). Casting directors contacted by The Associated Press did not want to comment for this story but the Casting Society of America issued a statement applauding Proyas and Lionsgate for recognizing that authenticity in casting is critical, and reiterating that its members are committed to diversity. Perhaps Hollywood's lengthy production pipeline just needs time to catch up with the public's demand for casting authenticity. In the meantime, preemptive apologizing seems to be the preferred way to get in front of the issue. David Poland, editor in chief of MovieCityNews.com, posits that the "pre-apology" is the new trend in Hollywood political correctness. "It started with that Hollywood Reporter mea culpa before publishing an all-white cover of actresses," said Poland, referring to a recent round up of potential Oscar nominees published in the industry trade magazine. "Somehow, they got positive feedback by getting out ahead of themselves on it and throwing up their hands." Boyd finds apologies like these to be empty rhetoric for the sake of political correctness. "At some point, people have to take responsibility, but nobody in Hollywood is going to do that. Ultimately they don't really feel as though that's their fault and perhaps their responsibility. They just don't want to be labeled as racially insensitive. It's the perception that they're concerned about." It remains to be seen whether the movie industry will ever completely eliminate its historic practice of ethnically inaccurate casting. What is virtually certain, however, is when there are lapses, the excuses and apologies will be out there long before the movie hits the multiplex.